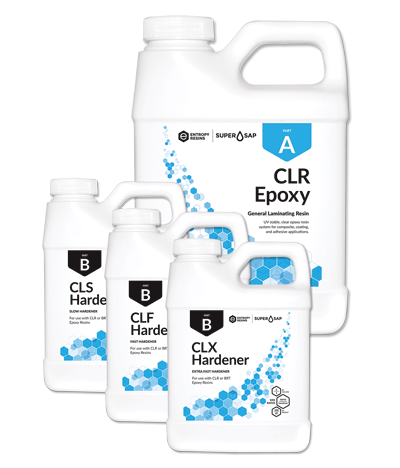 Clear Super Sap CLR Epoxy Resin, one of several Entropy products acquired by the makers of WEST System resins, is available with slow- and fast-curing times. A 2-quart-epoxy/1-quart-hardener kit retails for $95.50. The maker of WEST System and PRO-SET epoxy resins announced last January that it had acquired Entropy Resins of Hayward, California, a leader in bio-based renewable resins. Gougeon Brothers Inc. (GBI) CEO Alan Gurski says that he and Entropy CEO Desi Banatao saw each other annually at trade shows and chatted, eventually realizing they had much in common. Not only was each company founded by a set of brothers, they also shared a commitment to sustainability, environmentally sound products, and professionally run businesses. Small talk over the years about partnering eventually grew serious, resulting in GBI’s purchase. Gurski told Professional BoatBuilder that all Entropy operations have been moved to its facilities in Michigan. Desi Banatao has stayed on, while brother Rey continues to manage their separate sister company, Connora Technologies. As it was boatbuilding that led the Gougeon Brothers—Meade, Jan, and Joel—to the search for a better glue and ultimately epoxy back in the 1960s, the Banatao brothers, in Southern California, were similarly engaged in surfboards and other water toys. The Entropy product line reflects those interests. Super Sap CLR Epoxy Resin is billed as a high-performance coating system that is clear, resistant to yellowing, and works well over high colors of fiberglass and carbon. Available in fast- (21-minute pot life, 4-hour tackfree time) and slow-cure speeds with twice the time (43-minute pot life, 8-hour tackfree time), it’s also suitable for laminating and repairs. A 2-quart epoxy/1-quart hardener kit sells for $95.50. Other products include bio-based resins engineered for compression molding, casting, embedding, and high-build coatings. Recyclamine hardeners allow products made with thermosetting resins to be “dissolved” with a proprietary chemical solution so that the product—such as the snowboards made by Niche—can be recycled as another new product, be it a snowboard or surfboard. Gougeon Brothers, 100 Patterson Ave., Bay City, MI 48706 USA, tel. 989–684–7286, 866–937–8797, websites gougeon.com, www.westsystem.com, and www.entropyresins.com.